Two days after a Malaysian passenger jet bound for Beijing vanished with 239 people aboard, mystery still surrounds its fate. Malaysia on Monday said rescuers have yet to find any confirmed debris of the missing plane. Meanwhile, International police agency Interpol confirmed that two passengers on the flight had used stolen European passports. 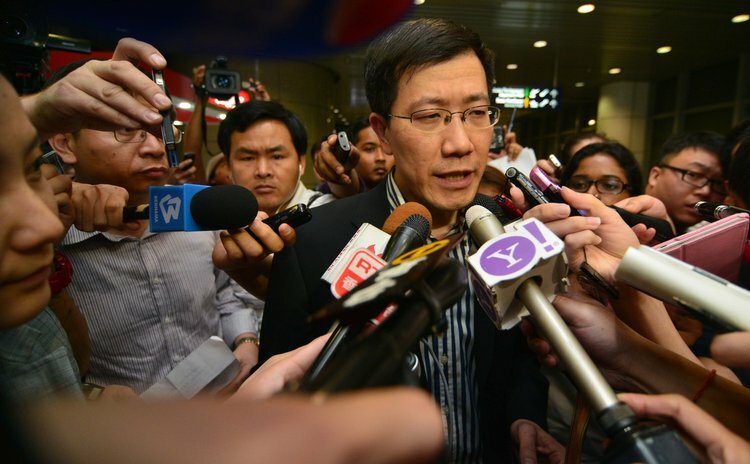 Azhaddin Abdul Rahman, head of Malaysia's Department of Civil Aviation said it had not verified reports that Vietnamese rescue planes had seen a part of the missing plane. Speaking at a press conference on Monday, the Malaysian official said the rescue team has not found anything that appears to be objects from the aircraft, let alone the aircraft itself. Clock is ticking as a multi-nation search and rescue operation is underway. Vietnamese Deputy Minister of Transportation Pham Quy Tieu said on Sunday that a command post will be set up on Phu Quoc Island for timely steering, monitoring and directing the work. So far, more than 30 ships and dozens of aircraft from ten nations have been involved in the search, with two more Australian maritime surveillance aircraft due to join in the operation later. Meanwhile, the search area has been extended from the South China Sea to the Strait of Malacca. Chinese marine police rescuers have found oil slicks in waters around the search site. But tests on the sample of the oil slick reveal that it was not from the missing Malaysia Airlines MH370 flight. Malaysian Maritime Enforcement Agency (MMEA) Eastern Region chief Datuk Nasir Adam revealed test results showed that the samples were actually from a ship. Vietnamese navy ship salvaged a floating lifeboat-like object Monday but confirmed it had nothing to do with the missing Malaysian plane. Vo Van Tuan, deputy chief of staff of the Vietnamese army says the object was a mossy-covered cable box. Besides, the international police agency Interpol on Sunday confirmed at least two passports recorded in its Stolen and Lost Travel Documents database were used by passengers on board missing Malaysia Airlines flight MH 370. Two European names -- Christian Kozel, an Austrian, and Luigi Maraldi of Italy -- were listed on the passenger manifest. But neither man boarded the plane. Both had their passports stolen in Thailand over the past two years. The Thai police said investigation is underway. As around two-thirds of the passengers aboard the missing aircraft are Chinese, China's Foreign Minister Wang Yi on Monday urged his Malaysian counterpart Anifah Aman to continue the search so long as there is a glimmer of hope. Meanwhile, the Chinese government is send a working group to Malaysia for handling the aftermath of the missing flight. The group aims to coordinate with Chinese Embassy in Malaysia to handle the relevant issues, including urging the Malaysian side to speed up search and rescue mission, investigating the incident and helping the family members already in Malaysia. The Boeing 777, which carries 227 passengers, vanished about an hour after taking off from Kuala Lumpur on Saturday. We will bring you the latest news as we receive it.